Other than cooking and gathering firewood, which at times seems like that's all you do at camp, there are plenty of activities to make the trip pleasurable and worthwhile. 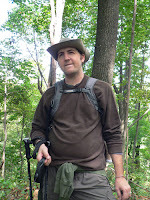 Even though there is a definite Thoreau-esque sense of accomplishment when staying in the woods all week with minimal essentials to accomplish all the camp chores, what's the point of living in the woods for a couple days to a week if you can't enjoy a walk in the woods, some photography, or a good book? 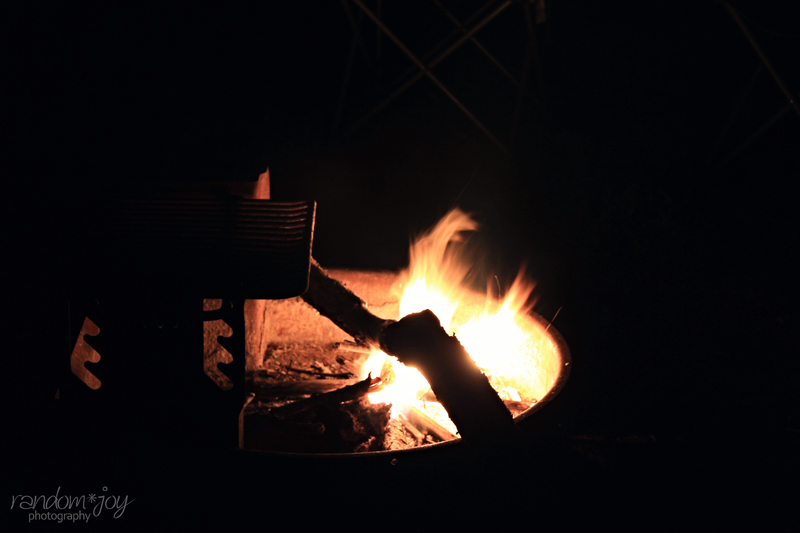 When we go on our camping trips, there's always different activities that we look forward to, and if you've brought the right "gear" you can get closer to nature and enhance the relaxation it can provide. 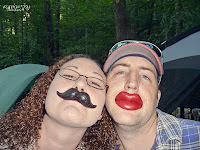 Most times we like to camp at Frozen Head State Park for our longer camping trips. Being there at camp gives us a distinct advantage that we "late to bed and late to rise" folks otherwise don't have. 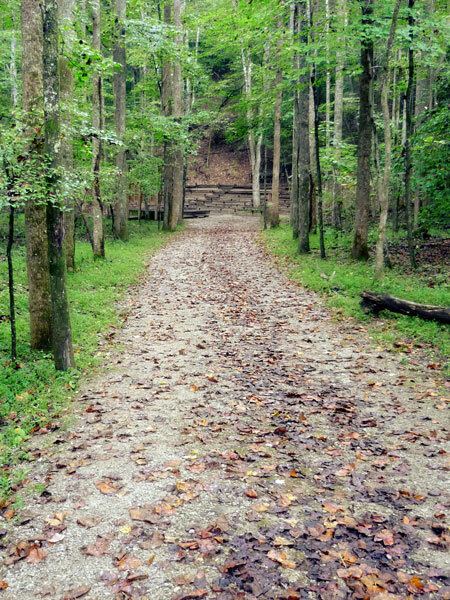 With over 80 miles of trails, being there at camp allows us to get on the trail for a nice long hike and not have to worry about driving back home when we get off the trail, totally exhausted. 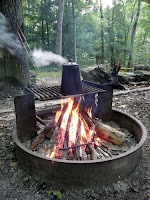 The only things to worry about after a good hike while camping is getting the fire going and what easy food we want to eat that night. Another great activity that we all love at camp is riding our bikes. In the campground and throughout the rest of the park, there's very little traffic, and it's usually slower than the bikes.You can really enjoy a good bike ride in this fashion as you don't have to worry about getting hit by a car like you might when riding in the city or some of the twisty and hilly country roads around here. Family bike rides are always a lot of fun and even more so while camping. 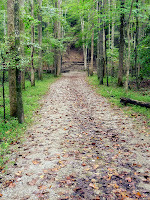 It provides great exercise and the scenery is wonderful. 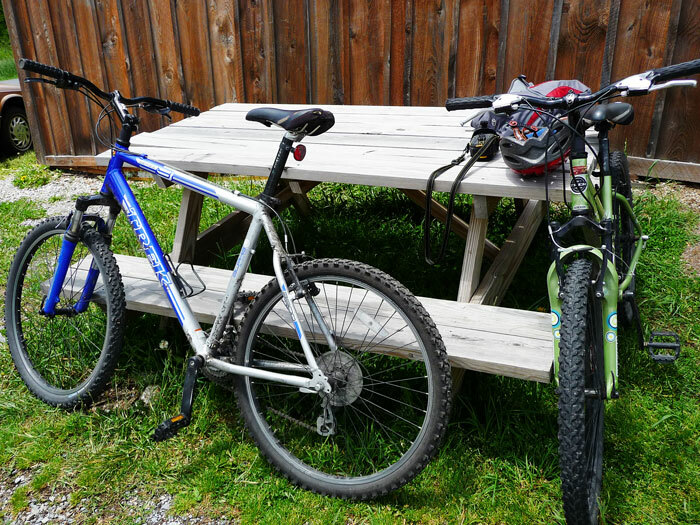 If you are camping at a park with trails, you might even get the extra bonus of trail riding, but make sure bikes are allowed on the trail before you peddle down it. For those of us with an affinity for photography, what better time to whip out our cameras and start snapping away? Besides that, you want to be able to cherish these trips for as long as you live. There's always plenty of flora, fauna, and wildlife to capture not to mention all the silliness the family gets into out there. You might also decide to go on a photo walk. Taking walks with the camera at camp with the purpose of finding those once in a lifetime shots are priceless. You never know what you might come back with. You can also arrange a photo scavenger hunt. Just come up with a list of things, or find one on the Interwebs, to capture on film or memory card and take off. This is a great way to introduce the yougin's to the wonderful world of photography and nature. Whoever wins can be king/queen of camp for the day. They can choose what's for dinner, who tells the first ghost story of the evening, or any other cool prize that will put a smile on their face and never forget their camping experience. There's plenty of other activities you can enjoy while camping: throwing a football around or a frisbee, riding scooters around the grounds, playing at the playgrounds, fishing, you name it. However, camp just isn't camp if you don't indulge in some lazy activities as well. Reading is a another favorite time of ours in camp. We finally have some time to read that trail book we've put off because of our busy and hectic lives. There are plenty of perfect, relaxing times to crawl into the hammock or on the lawn chair and get to reading that book you got for Christmas that now has an inch of dust on it. 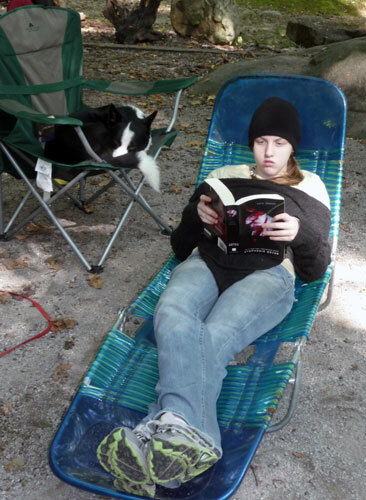 I don't know about you but I probably get more reading done in a week at camp than I do the rest of the year around home. If you are anything like we are, we typically bring a deck of cards and from time to time an easy travel game like Yahtzee or UNO . This really gets the family together around camp for some good solid quality time without interruption of the TV or telephone. A good game of rummy or plain ol' poker are excellent card games at camp. And you can use rocks and sticks for money. After all, you are in the woods, right? If you are like Robin, then you are very creative and haven't got a problem coming up with a ghost story or two on the spot. Heck, she usually has them thought up before we even get to camp most times. However, if you are more of the analytical/logical type like me and lack creativity or story telling ability, then there's nothing wrong with bringing a good ghost story book along. This is a great time to pass down traditions or teach lessons to the little ones about wandering around in the woods after dark and things like that. Your oldest kids - the ones wanting a BIG scare - might enjoy the story of The White Screamer. Tween ages like a bit of a scare, so a little acting and a story called Taily-Po will have them jumping, screaming, and laughing in no time. But if you've got little bitty ones, you might try some of the funnier, cuter American Indian stories like "Why the possum's tail is bare." You can usually get some good screams and laughs for that matter by acting out the parts, changing your voice around, and maybe even tossing things their way - like a previously hidden beach ball. Usually, in the parks we camp at, there is almost always some sort of program/activity given by one of the park rangers. 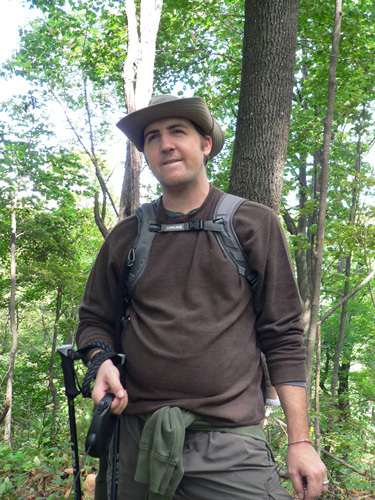 These are great opportunities to learn more about nature and/or the area you are camping in. Anything from Owl Prowls to Salamader Hunts, ghost hikes to astronomy viewings, you name it. 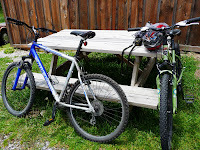 Usually on any of the trail kiosks or the park/campground visitor's center they have a list of activities for the day. Be sure to check them out and take part. The rangers always love to teach and share with visitors their expansive knowledge of the area's history or natural wonders. There's so many more different activities and plain ol' silliness that one can enjoy while camping. So many that it would likely require a week's worth of posts. However, we'd love to hear from you. 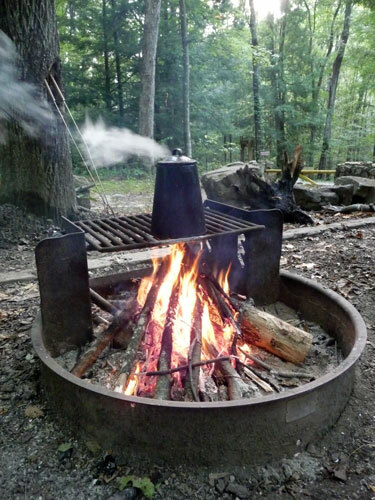 What are your favorite activities while camping? Spring Showers - Have you got wet weather gear?